Prefer training videos? SplitSuit has made an excellent all-in-one video guide to using the squeeze play as a bluff in FR and 6max cash games. The "squeeze play" is an advanced (usually pre-flop) move that can be used in both cash games and tournaments. The squeeze play can be very effective, but has to be used with caution. A squeeze play is when you notice a loose player raising from early position and another player calling this raise before you. You then make a big re-raise and take down the pot. So basically you are taking advantage of the loose raiser and the player who thought they could get away with calling the loose raise with a weaker hand than they would normally call with. The loose raiser can't call because they likely raised with a weak hand. The caller won't call because they were calling the first raise with a weak hand. Can you see why this play works? I'll cover why the squeeze play works in more detail a little later on. How to make a successful squeeze play. The implementation of the squeeze play in poker is determined by the situation, not the cards. You have to be able to read situations well when putting the play into practice, as it can otherwise prove to be costly. Therefore it is better to be able to understand how to use the play from the start, rather than taking a trial and improvement route. There are other players at the table, but for the purposes of this example we will assume that they all folded before or after Player A raised. Squeeze play example hand history. 1 fold, MP raises to t300, CO calls t300, 2 folds, Hero raises all-in t1,400, MP + CO folds. Squeeze plays in cash games and when deep-stacked in tournaments. When making a squeeze play in a cash game or in the early stages of a tournament you will likely be deep stacked, so going all in is not an option. However, it is still possible to make successful squeeze plays if you have strong reads on your opponent. 4 times the size of the initial raise is a good rule of thumb for the size of your reraise when making a squeeze play. Just be sure to be squeezing with hands that have potential (suited connectors and stuff like that) in case your squeeze gets called. If your post-flop game isn't up to scratch, I would advise against squeezing when playing cash games or if deep-stacked in a tournament. Why the squeeze play works. The effectiveness of the squeeze play stems from Player A’s table image. Player B knows that A has been raising a lot pre flop which means that it is less likely that he is holding a premium hand. Therefore B decides that he can afford to call this raise with another mediocre hand because he may well be ahead and has position on Player A. The second player calls the initial raise because they are aware that the loose raiser is unlikely to have a great hand. 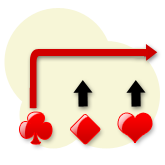 Now when the action reaches Player C, he is aware that it is unlikely that either of the players have strong starting hands, so he goes all-in forcing both Player A and B into a decision for all their chips with mediocre hands. Player A folds because he is only strong enough to raise and not call, and Player B folds because he only wanted to call the size of Player A’s raise to see the flop. Player A folds because they raised with a weak hand, and player B folds because they called with another mediocre hand under the belief that player A was weaker than them. As you can see, the cards that Player C holds is irrelevant to the outcome of the play. The move was employed successfully because Player C was able to accurately read the situation and act upon it. Now before you start thinking “that sounds simple enough”, there are a few other factors that are involved in making this play work. Tips for using the squeeze play. Reads on the other players. Your reads on the players left to act behind you are just as important as your reads on the players doing the raising and calling. You have to be fairly sure that you won’t run into another player acting behind you that will call your all in, otherwise you will be in a very hairy situation. This is why it is easier to make this play when in a later position as there is less of a chance of bumping into another player that does hold a premium hand. So by keeping the number of players left to act behind you to a minimum, you are increasing the play’s rate of success. Your own table image plays a very important role. If you have been involved in a number of pots and have been making a few plays, you are not in a good position to make a squeeze play in Texas Hold'em. The idea is to make your opponents think you have a big hand, forcing them to fold. Therefore if your opponents have noticed that you have been making moves with marginal hands in the lead up to this play, it decreases the credibility of your raise and they are more likely to call. The play will have a higher rate of success if you employ it only when you have a tight table image. The size of your re-raise. Another important factor is the size of your re-raise. The re-raise must be large enough to be able to push both your opponents off their hand, which is why the re-raise is usually an all in. Your re-raise is most effective as an all-in (as long as you are not deep stacked). If you are sitting with a short stack and the size of your all in is only going to be 2 or 3 times the size of the original raise, then it is very unlikely you are going to make either of them fold as you are giving them odds to call with most hands. As a rule of thumb you want your all-in to be at least 5 times the size of the original raise for this play to be effective. A key note to point out is that the combined total of the blinds and raises should be worth fighting for. If you are in the early stages of an MTT then there is no point is making an all-in squeeze play because you will be risking your tournament life for a very small pot. So the size of the pot must be big enough to fight for, but small enough so that your opponents won’t be priced in to call your all-in. The success of a squeeze play is determined by the accuracy of your reads on your opponents. All you need to make the play work is; one loose raiser, one loose caller, and one strong all in. This play will be a very strong addition to your game, but it should be used sparingly to help keep its credibility intact.